To commemorate the 800th anniversary of Magna Carta, and its visit here to Hong Kong, Sherif Elgebeily (Assistant Research Officer, CCPL) was recently interviewed by the RTHK for their programme “The Works”, where he discussed the relevance of Magna Carta to the Basic Law of Hong Kong. The video is available here. Programme Description: The 800-year old Magna Carta or “Great Charter” signed by the highly unpopular King John of England in 1215 as a solution to a political crisis under considerable pressure from a group of rebel Barons. The charter established for the first time the principle that everybody, including the king, should be subject to the law. 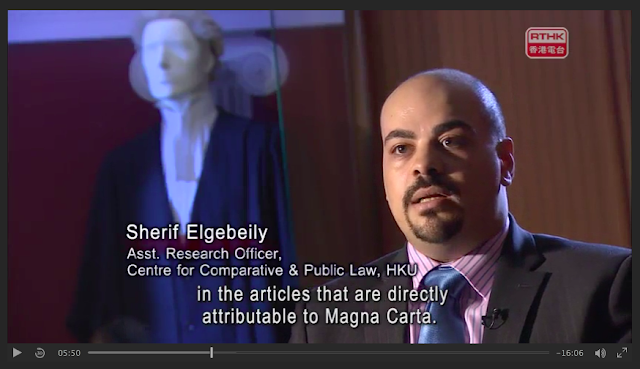 Not many of the specific provisions of the Magna Carta are in law today, but the principles underlying it remain a cornerstone of British political life and the Common Law system, and its influence has spread around the world. From Wednesday to Saturday this week (11-14 November 2015), one of just four surviving copies of the Magna Carta is on show in Hong Kong.